Judith Leiber and the Chatelaine, the first crystal minaudiere she ever designed. Portrait of First Lady Mamie Doud Eisenhower by Thomas Edgar Stephens, ca. 1959-1961, wearing her 1953 inaugural gown and holding Leiber's clutch. Today, Judith Leiber is best known for her crystal studded minaudières that have become synonymous with her eponymous brand and that can be found on every single red carpet. The artful small decorative handbags are being talked of in the same way as the stained glass of Louis Comfort Tiffany and the bejeweled eggs of Peter Carl Fabergé, but the 96-year-old handbag designer started her career in a far less luxurious environment and her creations have not always been so decorative. “Judith Leiber: Crafting a New York Story,” opening at the Museum of Arts and Design in April, is the first major retrospective of her work, aiming to highlight the breadth of her witty designs – think tiny minaudières in the shape of asparagus, a penguin or cupcakes) as well as her craftsmanship know-how. Born in Budapest in 1921, Leiber was already a skilled handbag maker when she moved to New York after World War II. She had been the first woman to apprentice at Pessl, a well-known handbag company in Budapest and had moved on to become the first woman as a master in the Hungarian Handbag Guild. After her move to New York in 1946, she quickly found a job with fashion designer Nettie Rosenstein. As the only female pattern-maker at that time, and with the ability to make a handbag from start to finish, Leiber brought training and skill that were rare in the United States, where handbags were almost exclusively made on assembly-lines. Her abilities were soon recognized and in 1953, she was assigned by Rosenstein to create a crystal-rhinestone pink beaded clutch for Lady Mamie Eisenhower to match a pink gown she would be wearing at the 1953 inauguration ball. Supported by her husband, an artist, Leiber started her own business in 1963 and faced early difficulties before striking on the idea that would revolutionize the handbag industry. In 1967, having received an order of brass minaudière that were in the wrong shade, she decided to improvise instead of rejecting them. Her first bag, the Chatelaine, was rather minimalist adorned only with clear crystal rhinestones, but it proved a success and she followed with more colorful sparkling minaudières. 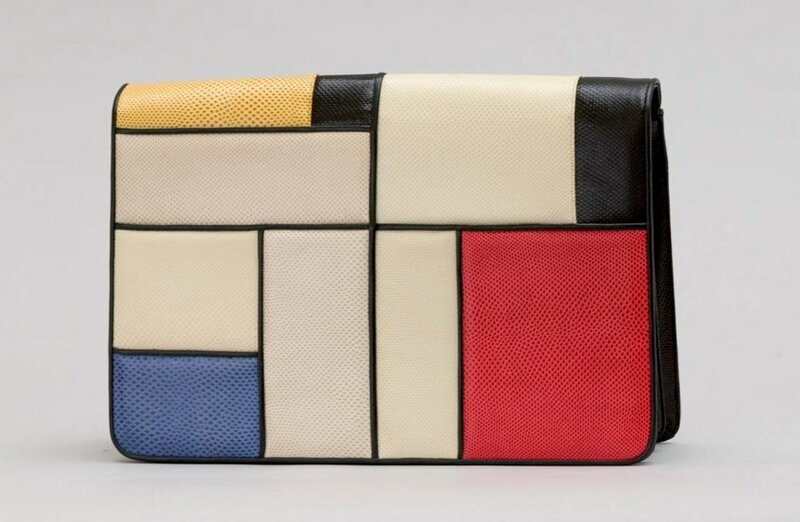 Soon her Swarovski crystal-encrusted creations represented more than half of her sales reflecting the high demand for her whimsical animal- and food-themed clutches, though she continued to create clutches in exotic skins such as alligator, ostrich and snake, some referencing artworks of Piet Mondrian , Sonia Delaunay.and Georges Braque. “Crafting a New York Story” is organized around a number of thematic narratives featuring Leiber as a craftswoman and immigrant entrepreneur; the evolution of the handbag in 20th-century fashion; the gendered nature of the handbag (vs. pockets); the importance of arts and culture on Leiber’s work; and the Leiber minaudières as carried by celebrities and other influential people including a number of first ladies. Having designed over 3,500 purses, Leiber sold her eponymous company in 1993, though she stayed on as a consultant until her retirement in 1997. The company continues today under the creative direction of Dee Ocleppo Hilfiger. The exhibition “Judith Leiber: Crafting a New York Story” runs April 4 to August 6, 2017.